The PalmInfocenter Store has rolled out a new mobile accessory store. The mobile optimized store lets users browse and buy Palm accessories right from their Palm device. The store carries many of the latest and most popular accessories for Palm devices including the Pre, Pixi, Centro, Treo's and classic PDA's. 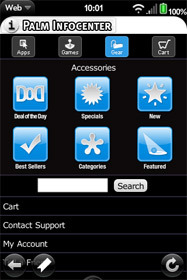 PalmInfocenter has long had an accessory store, which compliments our Palm OS software store. The store carries a wide range of accessories including cases, bluetooth headsets, extended batteries, chargers, cables and cradles, memory cards and much more. With the addition of the mobile accessory shop, customers can now get everything they need to make the most of their device in one convent spot. Shipping is available worldwide and starts at just $5.95 for most items delivered in the US. Payment can be made via major credit cards or paypal. Simply visit the PalmInfocenter mobile site and browse to the store, or key in m.palminfocenter.com on your phone. Looking for apps and accessories for non-Palm phones? Then checkout the PhoneFavs mobile portal, which carries apps and accessories for Android, BlackBerry, Windows Mobile, Symbian and more. Palm enthusiasts will enjoy your addition to their Palm experience.